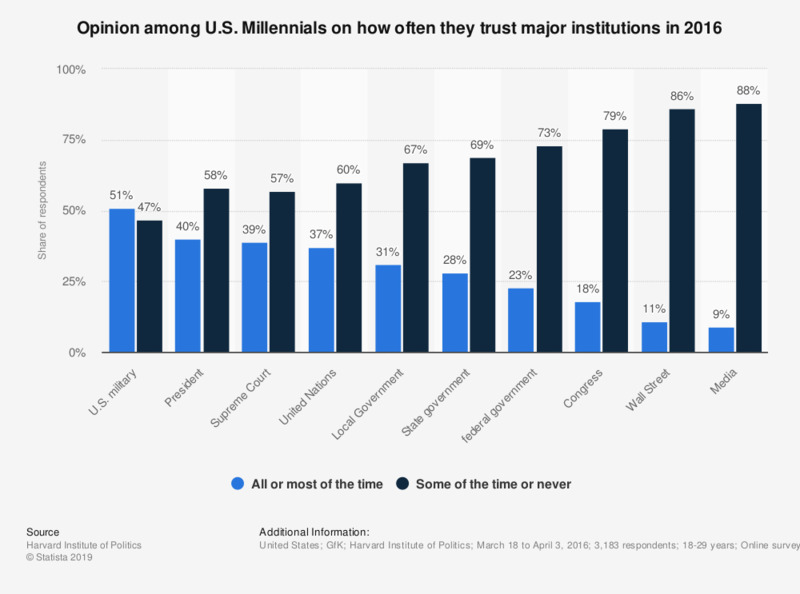 This statistic shows the level of trust U.S. Millennials have in major institutions in 2016. Fifty-one percent of U.S. Millennials said they trusted the United States military all or most of the time in 2016. Everything On "Millennials in the U.S." in One Document: Edited and Divided into Handy Chapters. Including Detailed References. Statistics on "Millennials in the U.S."
United States: Have you ever heard of these terms to describe generations? Millennials: Which of the following words or phrases describe your generation? Millennials: Which statement about jobs and technology do you agree with more? Millennials: At what age do you expect to retire? Millennials: What are your reasons for saving money? Millennials: Which of the following debts or loans do you hold? Millennials: Thinking of your favorite retailer, why do you shop here? Where do Millennials shop for groceries? How often do Millennials purchase store brands? Which product categories do Millennials shop online? Laptop computers: Difference in brand preference between Millennials and older generations in the U.S.
To what extent do you agree or disagree with the statement: "The media portrays young people in an fair/unfair light?" What advantages or benefits of in-branch banking are most appealing to you? Over the next few years in the U.S., do you think advances in technology willl improve or worsen the economic prospects of the average worker?